The recent commemoration of the start of the Reformation in 1517, when Martin Luther published his 95 theses, gave another opportunity to shed light on the important role of the Reformation and of Luther personally in music history. 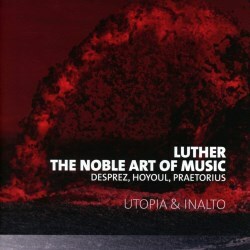 Luther had a strong liking of music, and he is known to have said that "musica est donum Dei optimi" - music is a gift of the Most High God. He was knowledgeable in musical matters and played the lute; Josquin Desprez was his favourite composer. However, he also considered music an important tool for the dissemination of the message of the Bible, and more in particular his theological views, in opposition to those of the Church of Rome. That is the reason why he saw it as his duty to write hymns in the vernacular. These could not only be the instruments to spread the message, but they could also reflect the emotions of the faithful and had an important pedagogical purpose as well. He wanted his hymns – and those written by others who followed his example – to be sung during service, in the homes of the faithful and at schools. Luther himself was responsible for quite a number of hymns, many of which are still present in the hymnbooks of our time, in Germany and across the world. They also have found their way into ‘art music’, such as cantatas and oratorios, and have been arranged in various ways in the course of history, until our own time. He often translated and reworked traditional liturgical texts, and sometimes adapted existing melodies. The present disc includes three specimens of the former procedure. Aus tiefer Not schrei ich zu dir is an adaptation of Psalm 130, as translated in the Vulgate (Psalm 129: De profundis clamavi). Vater unser im Himmelreich is certainly one of the best-known adaptations by Luther; its Latin counterpart is known as the Pater noster, and was part of the liturgy since ancient times. Another famous hymn from Luther’s pen is Christ lag in Todesbanden, which Johann Sebastian Bach arranged in a cantata for Easter (BWV 4). It is a reworking of a pre-existing German hymn Christ ist erstanden, which had its origins in the Easter sequence Victimae paschali laudes. In this programme some of the main exponents of hymn writing in Lutheran Germany are represented. The best-known of them is Johann Walter, who embodies the ideals of Luther more fully than anyone else. He wrote many hymns himself and published arrangements and harmonizations of hymns from his own pen or written by others. Stylistically close to Walter, was Matthaeus Le Maistre, who was of Flemish origin and worked in Germany where he converted to Lutheranism. Also from Flanders was Arnoldus de Bruck; he was in the service of the Habsburg family, and therefore he could not have any connections to Lutheranism. That did not prevent him from creating an arrangement of Luther’s hymn Aus tiefer Not. David J. Burn, in his liner-notes, rightly emphasizes that there was no watershed between Catholicism and Lutheranism in musical matters. The same applies to Lupus Hellinck, another Flemish composer, who for most of his life worked at St Donatian in Bruges. In a programme like this, settings by Caspar Othmayr can’t be omitted. He can be considered one of the main promoters of Lutheran church music. A considerable part of his output has a pedagogical purpose, for instance a collection of bicinia, from which the two pieces included here are taken. Balduin Hoyoul is from a later generation, and again we have someone from Flanders here: he was born in Liège, but was a choirboy at the court in Stuttgart and then studied with Lassus in Munich. The Bavarian court was strongly Catholic, but after his return he took up his duties at the Lutheran court in Stuttgart again. Unser Vater in den Himmeln is a setting of a text which is a little different from Luther’s, and also has a different melody. With Johannes Eccard, Michael Praetorius and Johannes Crüger we are on the brink of a new time, which shows an increasing influence of the Italian style. That comes most clearly to the fore in the oeuvre of Praetorius, who made use of the polychoral style as developed in Venice, with which he became acquainted through manuscripts; he never went to Italy himself. His adoption of modern fashions was important for the development of the hymn, as he showed that these – although rooted in the stile antico – could be easily adapted to the taste of the time. Eccard was more conservative: he was a pupil of Lassus and mostly stayed close to the style of his teacher. He never composed anything with a basso continuo part. Crüger is the latest composer in the programme. He was the main composer of hymns of the 17th century, often on texts by the poet Paul Gerhardt. His setting of Aus tiefer Not is an arrangement of an earlier piece for four voices, two optional melody instruments and basso continuo. That shows that he embraced the new concertato style from Italy. This selection of settings of three different chorales is most interesting, as it shows the development in style within a period of about one hundred years. The older settings usually have the hymn melody in the tenor, in the tradition of the Tenorlied, whereas in newer settings the melody is mostly in the soprano. That certainly has a pedagogical motif: collections of hymns were also intended for schools, and when the melody is in the upper voice it is more easily recognizable. In addition we hear some pieces by Josquin Desprez, some of them performed instrumentally, which reflect Luther’s appreciation of the composer. We also hear some settings of the original Latin chants which were the source of Luther’s arrangements. In this way his activities in the field of sacred music are put into their historical perspective. This is a substantial contribution to the commemoration of the Lutheran Reformation. Settings of hymns such as those performed here are relatively straightforward, and as a result they are seldom performed in concerts or recorded. This disc shows that they are well worth being brought to our attention. These hymns were the source of inspiration for some of the greatest composers in history, such as Johann Sebastian Bach and Felix Mendelssohn-Bartholdy. Utopia and InAlto deliver pretty much ideal performances. The singers have very clear voices, which blend perfectly and make sure that the text is always clearly intelligible. The instruments add colour to the hymns, and the mixture of voices and instruments reflects one option for the performance of this repertoire.